As a pupil of John Lyman at McGill University and Goodridge Roberts and Group of Seven member Arthur Lismer at the Montreal Museum of Fine Arts, Paterson Ewen had an early training in keeping with the traditional figurative style of painting of the early post-war period. 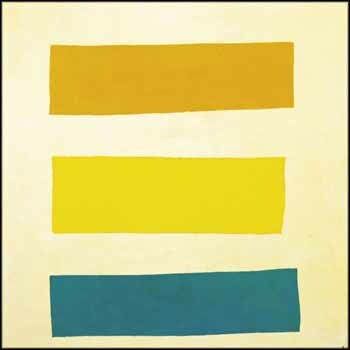 However, the 1950s marked a turning point in Ewen's artistic approach, as his relationships with Paul-Émile Borduas and the Automatists ushered him into the avant-garde world of abstraction. By the 1960s, Ewen transitioned into a style of geometric abstraction influenced by the work of his contemporaries Claude Tousignant and Guido Molinari. Elongated Rectangles showcases Ewen's transitional process, as he worked past the figurative approach of his predecessors and experimented in the world of the avant-garde. Ewen's expert skill at compositional arrangement is manifested in this work as he stacked the three rectangles, creating a structural formation that is rhythmic and optically balanced. He interposed a yellow rectangular form between blocks of complementary blue and orange, creating a vibrant visual effect. This colour palette, which skilfully balances cool and warm hues, reappears in several of his iconic 1970s works on plywood.